In Navtej Singh Johar et al v. Union of India & Ors., on 6th September 2018, the Supreme Court read down Section 377 of the Indian Penal Code. Consensual sexual conduct between adults would no longer be a crime. It also held that members of the LGB and transgender community are entitled to all the liberties protected by the Constitution. In the judgment, which reversed the 2013 Koushal decision, the Supreme Court held that discrimination based on sexual orientation and gender identity is a violation of the fundamental rights to autonomy, privacy, equality, dignity, and non-discrimination. 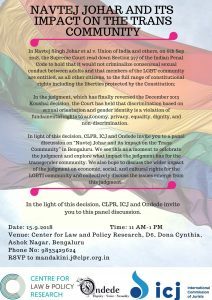 In the light of this decision, CLPR, International Commission of Jurists and Ondede invite you to a panel discussion on “Navtej Johar and its impact on the Trans Community”. Our panelists are Akkai Padmashali, Ondede, Jayna Kothari, Executive Director, Centre for Law and Policy Research, Arvind Narrain, ARC International, and Rajesh, Sangama. We see this as a moment to celebrate the judgment and explore what impact the judgment has for the transgender community. We also hope to discuss the wider impact of the judgment on economic, social, and cultural rights for the LGBTI community and collectively discuss the issues that emerge from this judgment.